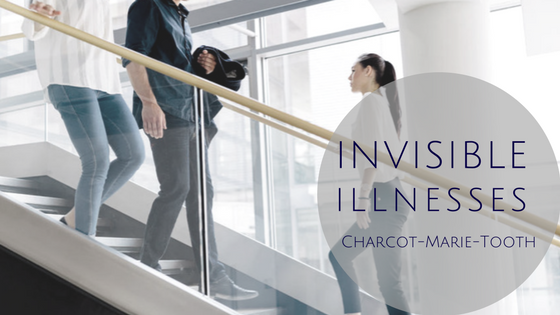 Charcot-Marie-Tooth can be an invisible illness. It isn't always. Some people with Charcot-Marie-Tooth are in wheelchairs or wear leg braces/supports or use walking aids. Many of us have clawed toes and fingers. Some have curved spines. But it can be invisible and in the early stages it often is. Charcot-Marie-Tooth, named for the three Drs that discovered and diagnosed it, is a type of (oddly common) neuropathy that affects both motor and sensory nerves. It is usually inherited. In fact, it's other name is Hereditary motor and sensory neuropathy. I was diagnosed with CMT in my 30s after years of being bad at sport and even bad at walking! I was teased as a teen and have struggled in some jobs due to my poor motor skills (very weak hands and clawed fingers). It was a relief to be diagnosed. Knowing why you can't do what everyone else can is actually very liberating. I can tease myself now, shout "oh you silly helpless cripple!" when I can't remove the bank card from the ATM (no pincer grip with my fingers), and I can use a walking stick on days I feel especially wobbly. And that's what I wanted to tell you. You might see people park in a disabled bay, with a blue badge of course (I don't have one yet, I may reapply, but last time I tried I was deemed fit enough to walk far enough to get by without one), you might see them get out of the car and pop into a shop, they don't look very disabled do they? You might see someone in a wheelchair get up and walk, where there are a few steps, to help their mate who has to get the chair down the steps. Has there been a miracle? Maybe a wheelchair user gets up to reach up to a high shelf in a supermarket, are they playing a prank? Maybe a women is crying because she can't open a water bottle, what's wrong with her? Charcot-Marie-Tooth (and many other illnesses) can be hidden,they are still there, lurking beneath the surface, we don't want to be ill, we don't want to be weak. We just want to be able to do the things that able bodied people do every day with out thinking about it. 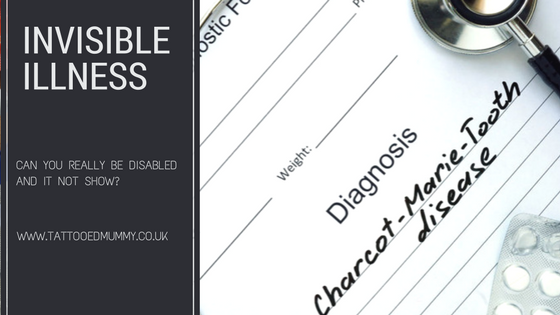 So this September (and always) think about invisible disabilities, but particularly Charcot-Marie-Tooth as September is awareness month. Try and remember that when a person that appears visibly fit asks to take the lift rather than the stairs, they might not be 'lazy' (if I had a £ for every time work colleagues have joked that I'm lazy when I take the lift I'd have £28) they might need to use the lift. When they take an age to descend a staircase, clinging to the handrail there could be a reason beyond what you can see. When a grown up asks you to open their Pepsi, think of the embarrassment they already feel, the bravery it has taken to ask a stranger, they don't need to be laughed at or called weak (all of this especially important to tell teens as they start school or college too - CMT gets worse as you age but embarrassment at asking for help from peers increases). Lend a hand when you can. Be patient, be considerate, be kind.